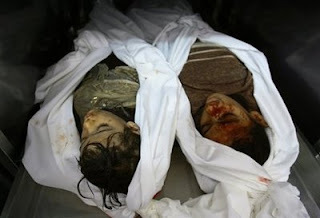 PNN -Israeli forces killed two girls in an air attack on Beit Hanoun in the northern Gaza Strip early Tuesday. Local sources report that a missile destroyed a house belonging to Talal Hamdan in Beit Hanoun, killing his two daughters of 12 and 4 years old. A son is reported seriously injured. Yesterday Israeli forces killed four sisters and a four year old boy. 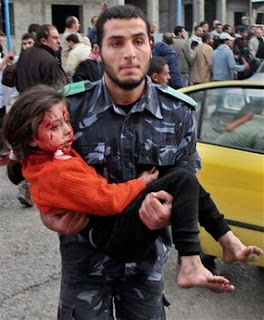 A Palestinian security force officer carries a wounded girl into the emergency room at Shifa hospital in Gaza City , Saturday, Dec. 27, 2008. 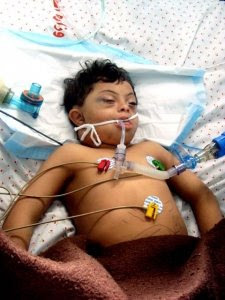 Shifa hospital ICU: a six year old with down syndrome suffers brain trauma after Israeli attack. These pictures clearly debunk the Israeli claim that only the Hamas fighter are being targeted. "About 30 percent of our cases are children" says Dr. Fawzi Nablusi, one of al-Shifa's hospital emergency room doctors. A paramedic working for an Oxfam-funded organization was killed today after an ambulance was hit by an Israeli-fired shell, according to British charity Oxfam. Israel is not enhancing its security by lengthening the list of war crimes committed by Israeli military and government against the Arab population since its founding. In fact, if Lebanon is any guide, the Jewish state is making itself less safe with every innocent casualty it causes in Gaza. It is strengthening Hamas rather than weakening it by its dastardly behavior in Gaza. Please review and sign this online petition to the US Foreign Relations Committee to exert Congressional influence on Israel to end atrocities on Gazans. Help Gazans by donating money through UN Relief and Works Agency for Palestine Refugees (UNRWA). International Day of Dignity in Support of Gaza is planned for Friday January 9, 2008. There will be an Open Friday Prayer in the San Francisco Civic Center at noon on January 9 to pray and express our solidarity with Gazans. Please check to find out the nearest location to you to express your support for the Gazans under vicious Israeli assault. Please click here if you are on Facebook. 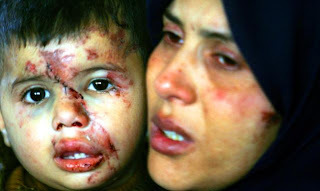 Its not the bad israel.. it is due to bad Muslims and their rulers who dont have the courage to speak against israel. May ALLAH show us the correct path and the courage to stop evil by force. God! Why is the world so selective in its responses? Israel ought to be cursed. Thanks Riaz for your courage. These are indeed virtual shoes being thrown at the face of the pseudo liberals, democrats, civilized world. Its unfair to blame IAF for it. Which civilized country keeps rocket caches and mortars under basement of where civilians live?..cowards.. Hamas,Hezbollah..al-qaeda. Israelis value life of their citizens, so too bad for Palestinians. Riaz you are doing great work by doing al-qaeda media work. This is exactly what they want.Fire rockets against their (israeli) population and provoke Israelis,then when they hit ammunition dumps...dead children...Great content for al-jazeera. More suicide bombers..Good Ones. I thought by the speeches given (lately) by Benazir(PBO Her),Gilani and Zardari, Pak have enough of them. But your contribution is invaluable. Good luck with that. I am disappointed but not surprised to see that nothing will shock your conscience when it comes to defending the brutal actions of India-Israel-US axis against innocent populations, even women and children. While I have often observed the label "anti-Semitic" applied to critics of Israel, you have chosen to go far beyond that usual fare by using "al-Qaida" label against those who expose and criticize Israel's war crimes against humanity. Shame on you! Jaydev defines the cold blooded Mumbabi terrorist who then turn around for more blood by blaming others. He is the RSS/Modi/Thakery face of shining India. By Robert Fisk of Independent says "The Rotten State of Egypt is too Powerless and Corrupt to Act"
January 04, 2009 "The Independent" -- There was a day when we worried about the "Arab masses" – the millions of "ordinary" Arabs on the streets of Cairo, Kuwait, Amman, Beirut – and their reaction to the constant bloodbaths in the Middle East. Could Anwar Sadat restrain the anger of his people? And now – after three decades of Hosni Mubarak – can Mubarak (or "La Vache Qui Rit", as he is still called in Cairo) restrain the anger of his people? The answer, of course, is that Egyptians and Kuwaitis and Jordanians will be allowed to shout in the streets of their capitals – but then they will be shut down, with the help of the tens of thousands of secret policemen and government militiamen who serve the princes and kings and elderly rulers of the Arab world. And amid all this, Egyptians have to live amid daily slaughter by their own shabby infrastructure. Alaa al-Aswani wrote eloquently in the Cairo paper Al-Dastour that the regime's "martyrs" outnumber all the dead of Egypt's wars against Israel – victims of railway accidents, ferry sinkings, the collapse of city buildings, sickness, cancers and pesticide poisonings – all victims, as Aswani says, "of the corruption and abuse of power". Opening the Rafah border-crossing for wounded Palestinians – the Palestinian medical staff being pushed back into their Gaza prison once the bloodied survivors of air raids have been dumped on Egyptian territory – is not going to change the midden in which Egyptians themselves live. Before we all get our knickers in a twist just have a look at the photographs on the link below. Just substitute Palestinians with Baloch and IAF with PAF and you'd be hard pressed to spot the difference.And these were not enemy aircraft but the country's own. Is there a justification for this? Wake up! nice. Nip the suicide bombers in the bud. A new wave of hatred towards Palestine is sweeping through Israel from public figures to the man on the street. This hostility is in sharp contrast to efforts in Cairo, where Arab leaders and Western diplomats are trying to hammer out a peace plan. While Palestinian Liberation Organisation (PLO) official Nabil Sheath expressed hope Sunday night that negotiations would continue, very different noises were coming out of Israel. Interior Minister Eli Yishai said Operation Pillar of Defense would continue and likely be expanded, a reference to the possibility that a ground offensive has already been given the go-ahead. The war in Gaza “must be so painful and difficult that the terror groups will not think twice but a hundred times before they fire missiles against Israel again,” it was reported in The Israel National News. “Destroy and damage infrastructure, public buildings and government buildings. We must make sure that Hamas will be spending many years rebuilding Gaza, and not attacking Israel,” he continued. The Oscar-nominated documentary, directed by Israeli filmmaker Dror Moreh, uses interviews with all six living ex-directors of the Shin Bet to paint a stark portrait of the agency and how it figures into the Jewish state's past, present, and future. For those who haven't heard of this security service, here are a couple lines from my crib sheet: Imagine the FBI, only tremendously more efficient, brutal, and terrifying. Now, imagine if the war on terror were half a century old, and if we had drone strikes and black sites in Florida and Montana. That's what the Shin Bet is like for Israelis. It's a juggernaut of counterterrorism and intel gathering. Shin Bet directors answer directly to the prime minister. The agency's greatest blunder was their failure to protect Yitzhak Rabin, the Israeli leader who came closest to making peace with the Palestinians, from being murdered by a right-wing Israeli terrorist. 1. "Talk to everyone, even if they answer rudely. So that includes even Ahmadinejad, [Islamic Jihad, Hamas], whoever. I'm always for it. In the State of Israel, it's too great a luxury not to speak with our enemies…Even if [the] response is insolent, I'm in favor of continuing. There is no alternative. It's in the nature of the professional intelligence man to talk to everyone. That's how you get to the bottom of things. I find out that he doesn't eat glass and he sees that I don't drink oil. "—Avraham Shalom (1980-86), on negotiating with the enemy. 3. "We've become cruel. To ourselves as well, but mainly to the occupied population." Our army has become "a brutal occupation force, similar to the Germans in World War II. Similar, not identical. "—Shalom, who clarifies that he is referring to the Nazis' persecution of non-Jewish minorities. 4. "We don't realize that we face a frustrating situation in which we win every battle, but we lose the war. "—Ami Ayalon (1996–2000), regarding the wisdom of Israel's counterterrorism measures. 5. "To them, I was the terrorist.… One man's terrorist is another man freedom fighter. "—Yuval Diskin (2005-11), candidly discussing the very first time he considered his profession from a Palestinian perspective. But the film's contribution to any political discussion on the topic goes way beyond its quotable shock value. It's the culmination of a personal saga for these six warriors, packaged in one raw, brilliantly paced film with stunning visuals. "After retiring from this job, you become a bit of a leftist," Yaakov Peri, who ran the Shin Bet during the First Intifada, says with a sad smirk. The narrative unfolds as a modern tragedy where the characters' career highs are forever marred by a sense that they've retired only to become Cassandras. And for all their tactical successes on the battlefield, they see an Israel poised to lose the war if it continues to give up on peace. “What makes a country good isn’t whether it is happy or not, it’s the ethics and morality of the country. When soldiers are conditioned and persuaded on a daily basis to subjugate and humiliate people and consider other human beings as less than human, I think that seeps in, and I think that when the soldiers go home … they bring that back with them.” Those words – precise, pained, obvious – are from Cpl. Shachar Berrin, 19, a lone soldier who wears a knitted skullcap and serves as a combat soldier in the Home Front Command rescue unit in the Jordan Valley. Corporal Shachar Berrin, an immigrant from Australia and a religiously observant lone soldier – he has no family in Israel – is waiting to be sent to military prison. Berrin is a member of the rescue unit of the Home Front Command, and is stationed in the Jordan Valley.